The Spies Panel. Photo by Jim Haberman. Recent discoveries by a team of specialists and students at Huqoq in Israel’s Galilee, led by University of North Carolina at Chapel Hill professor Jodi Magness, shed new light on the life and culture of an ancient Jewish village. The discoveries indicate villagers flourished under early fifth century Christian rule, contradicting a widespread view that Jewish settlement in the region declined during that period. The large size and elaborate interior decoration of the Huqoq synagogue point to an unexpected level of prosperity. 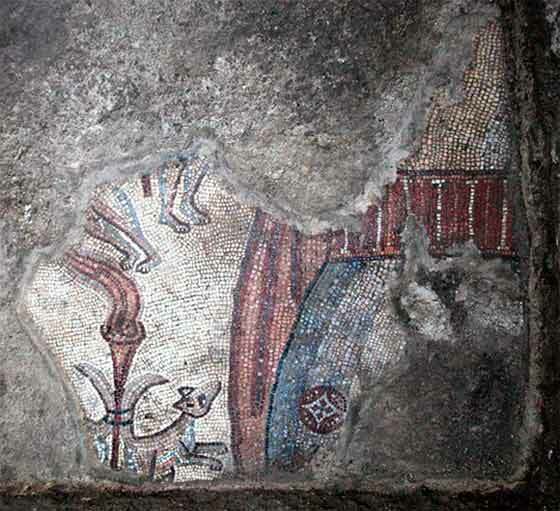 The first mosaics in the Huqoq synagogue were discovered by Magness’ team in 2012. Since then, Magness, director of the Huqoq excavations and Kenan Distinguished Professor of Early Judaism in the Department of Religious Studies in Carolina’s College of Arts and Sciences, assisted by Shua Kisilevitz of the Israel Antiquities Authority and Tel Aviv University, has uncovered additional mosaics every summer. This year, the team’s specialists and students focused their efforts on a series of mosaic panels in the north aisle. Magness said this series is part of the richest, most diverse collection of mosaics ever found in an ancient synagogue. An image of the most recent discovery, images from past digs and video from this summer’s excavation may be downloaded on the UNC Photoshelter website using password huqoq.